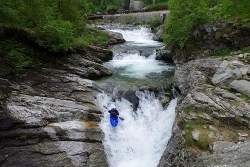 Six excited paddlers left London for the long journey to Campertogno, Piemonte area in Italy where our gorgeous campsite next to the river Sesia awaited us. 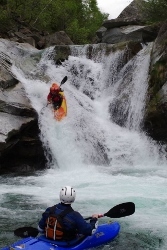 Day 2: With river levels dropping we decided to paddle the Sesia Gorge. This provided us with a bit more of a challenge, with numerous stoppers catching many of the crew out and the swim numbers notched up. After the grade 6 section was successfully navigated by a fairly lengthy rock scramble portage river left, the gorge continued to catch people out. 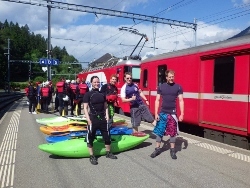 It turned out to be a long day paddling, but we all made it safely off the river in what we thought was all in one piece…. After a swim in a stopper where we thought Ciaran’s was just giving us the finger from the other side of the river perched on a rock, it turned out that the next day when we visited Borgosesia hospital that x-rays showed he indeed did have a small fracture on the bone above the joint of his middle finger. The Italian doctor recommended surgery within 5 days. A flight home was booked, and the group then became five. With the sad departure of Ciaran back to London to see to his broken finger, and little water now left in the rivers a park and play day became the plan of choice. The sorba slides were just too much fun to do not run again and again, and this helped to do some cheering up of the group. We then drove to the top drop of the Egua, where more smiles and great photos were created. On the last day in Valsesia we paddled one of the few rivers with water in it, everyone from the Campsite seemed to be there too, the Lower Sermenza. Rain did start to fall this day which the paddlers welcomed. Although we went from not enough water, to too much water for us, and decided to head to a new area we hadn’t paddled before on our way back to the UK. 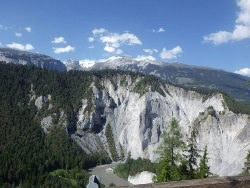 We went to Versam in Switzerland based on a recommendation to paddle the ‘vorderrhein’ which ran through what has become known as the ‘Swiss grand canyon’. An absolutely stunning paddle, but topped off with a novelty shuttle where you catch the train to the start of the river! Two train tickets were needed, one for ourselves and one for our boats! 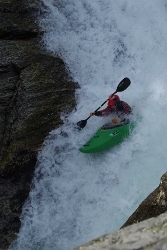 I still can’t believe that there was a special ticket for watersports equipment. . With the sun shining, and shorty cags worn, it felt like proper Alpine summer paddling again. A perfect end to the trip.